Lodging at OSBS is available year-round at the for Station users. The cottage can accommodate up to three guests, with single occupancy per room. 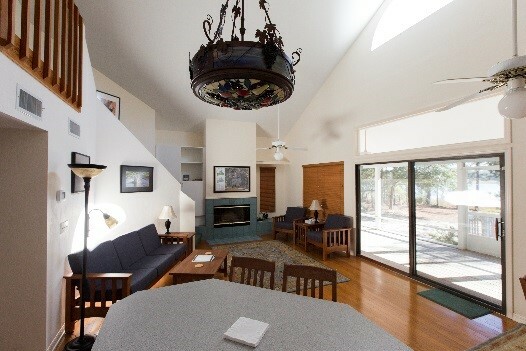 The cottage is fully furnished with ac/heat, a shared bath, full kitchen (including microwave), washer & dryer, and a beautiful screened porch overlooking Long Pond. 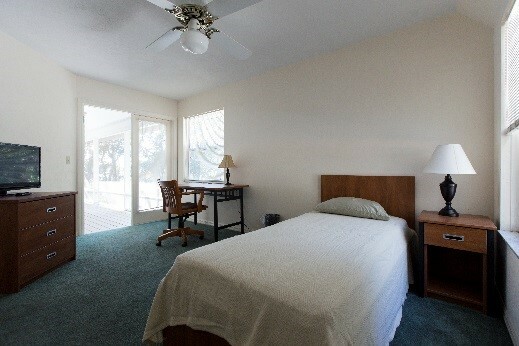 Each guest room has a twin captain’s bed, closet, bureau, writing table, and a television. 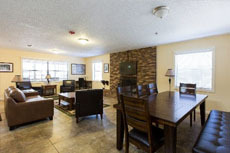 Residents are responsible for keeping the cottage neat and orderly during their stay. Cooking is permitted. 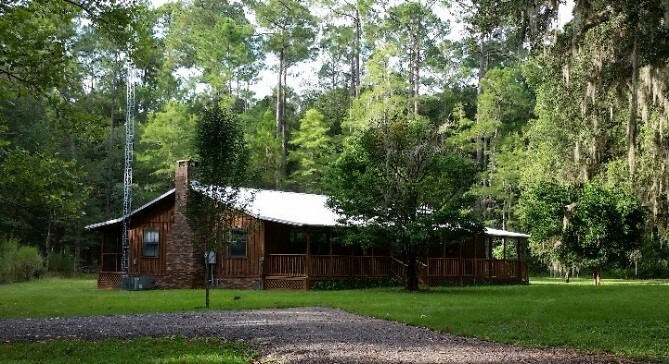 Internet access is not available at the cottage, but is available at the Conservation Center. * Rooms that are not rented by your party may still be rented out to other guests. Check-in: 12:00 PM, Check-out: 10:00 AM. These hours may be flexible depending on use level. Check with Office Manager when scheduling your visit. The cottage is stocked with an initial supply of toilet paper, trash bags, and dish soap. 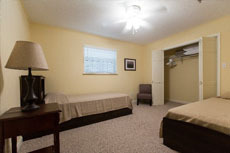 In each guest room: Two sets of bed linens, towels, and wash rags are provided. The kitchen is fully stocked with dishware and cookware. Guests are expected to wash dirty dishes and cookware before leaving. A $20 charge will be added if not completed. Use of the fireplace is prohibited. Smoking is prohibited on all UF properties including OSBS facilities and lodging. Alcohol is prohibited on OSBS property and facilities including lodging. Remove garbage from kitchen and bathroom and place in garbage can outside. Strip beds and leave dirty linens on bedroom floor. Place dirty towels and washcloths on the bathroom floor. Notify Office Manager of any damages or issues during your stay. Personal toiletries, which includes bath soap and shampoo. Laundry detergent if you plan to use the washer/dryer. You will need to bring food and beverages. It is suggested that guests should stop at one of the grocery stores in Melrose to stock up on your way to the cottage. 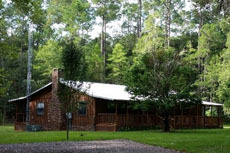 The Cypress Bunkhouse can accommodate up to eight guests, with multiple occupancy per room. All beds are twin-XL captain beds. The bunkhouse is fully furnished with ac/heat, two full baths, full kitchen (including microwave and oven), washer & dryer, TV and Blu-ray player. 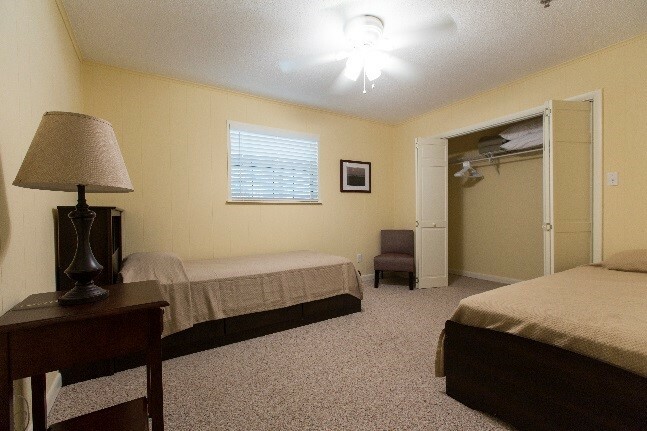 Residents are responsible for keeping the bunkhouse neat and orderly during their stay. Cooking is permitted. 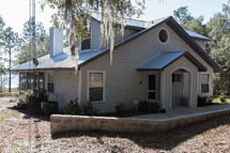 Internet access is not available at the bunkhouse, but is available at the Conservation Center. * A minimum of 4 persons is required to reserve the facility unless the cottage is fully occupied. The bunkhouse is stocked with an initial supply of toilet paper, trash bags, and dish soap. In each guest room: Two sets of bed linens per bed, pillows, blankets. Towels and washcloths provided in bathrooms. Domestic animals are not permitted unless necessary to help a disabled user. Please notify Station administration in advance. 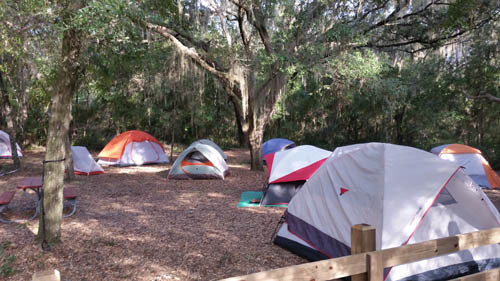 For research visitors and classes that need to stay overnight and would like to tent camp, OSBS has a primitive campground (no power). There are picnic tables, potable water, and a common fire pit. 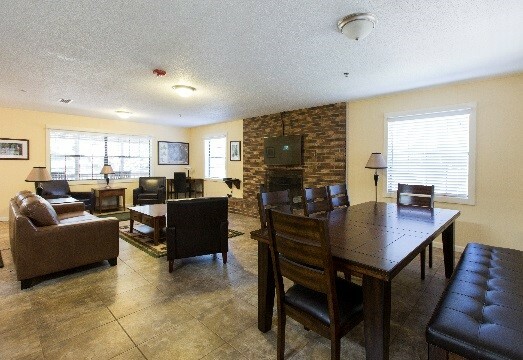 Access to a galley kitchen, washer & dryer, and bathroom/shower are available. Researchers - $10/night/person. The project PI is responsible for collecting and submitting the individual fees from accompanying group members. UF Courses - No charge*. 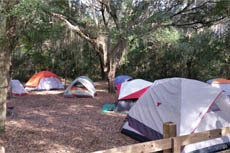 A UF faculty member or TA must accompany classes wishing to camp. UF& Station policies must be observed.